BEIRUT The international envoy to the Syrian conflict on Wednesday called on President Bashar Assad's regime to take the lead in implementing a cease-fire during a major Muslim holiday later this month. "The Syrian people are burying hundreds of people each day, so if they bury fewer people during the days of the holiday, this could be the start of Syria's return from the dangerous situation that it ... is continuing to slip toward," he told reporters in Beirut. Brahimi's push to get Assad and rebels seeking to topple him to stop fighting for the four-day Eid al-Adha feast set to begin Oct. 26 reflects how little progress international diplomacy has made in stopping 19 months of deadly violence in Syria. Unlike his predecessor as joint U.N.-Arab League envoy, Kofi Annan, Brahimi has said he has no grand plan to end Syria's civil war. Instead, he presented the truce as a "microscopic" step that would alleviate Syrian sorrow temporarily and provide the basis for a longer truce. Even a short-term cease-fire faced hurdles. Both sides in the past have verbally signed on to cease-fires only to then blatantly disregard them. And before Brahimi spoke, Syria's government dismissed the plan, saying the rebels lack a unified leadership to sign the truce. The scores of rebel units fighting a brutal civil war against the regime have no single leader, and many don't communicate with each other. 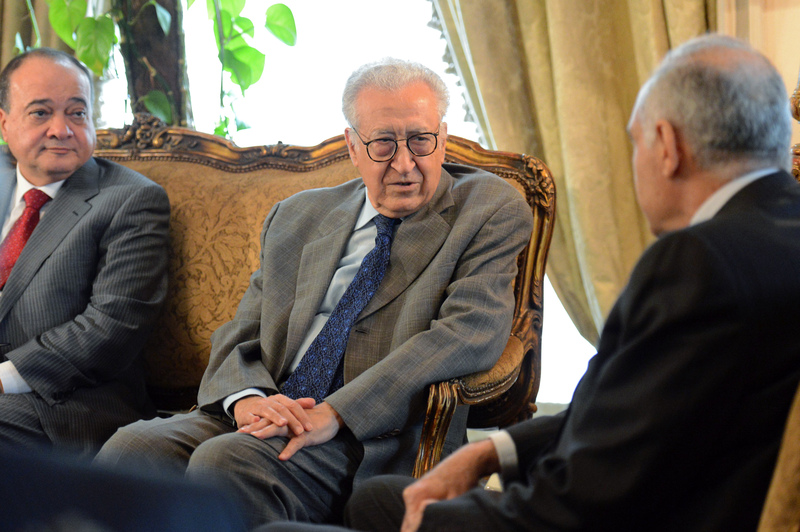 Brahimi spoke following meetings with top Lebanese officials as part of a regional tour. He said all countries must work to stop the bloodshed by halting arms shipments so the conflict doesn't spread. Turkey, Saudi Arabia and Qatar are sympathetic to the rebels and are believed to be facilitating their acquisition of weapons or arming them directly. Iran and Russia are Assad's biggest supporters and provide the Syrian military with most of its advanced weapons. "These countries need to realize, as we heard today in Lebanon, that it is not possible that this crisis will stay inside Syrian border forever," he said. "Either it has to be taken care of or it will spread and spill over and consume everything." Syrian Foreign Ministry spokesman Jihad Makdessi said the government was waiting for Brahimi to come to Damascus to brief officials there on the results of his tour. The regime would welcome any "constructive initiative," Makdessi said in statement released Wednesday by the state news agency. It was unclear if Brahimi would travel to Damascus from Beirut. Activists say more than 33,000 have been killed since Syria's uprising started in March 2011. Fighting continued Wednesday, with activists reporting clashes in the northern provinces of Idlib and Aleppo as well as outside of the capital, Damascus. Amateur videos posted online showed what rebels said was a helicopter shot down by rebel fire near the northern town of Maaret al-Numan. Clashes have been raging in the area since rebels took the town last week. One video shows a white helicopter spiraling as it falls through the sky, leaving a trail of smoke behind before bursting into flame. Rebels on the ground can be heard chanting "God is great!" "The planes are hitting us as revenge," said the activist, who gave his name as Qais al-Idlibi. "They can't make progress on the ground, so they are hitting us from the air." He said the remaining civilians sleep outside in their fields for fear of airstrikes, and the shooting boosted their morale. Activist claims and videos could not be independently verified. Syria's civil war has displaced more than 1 million Syrians inside the country and sent hundreds of thousands more over the borders to see refuge with Syria's neighbors. On Wednesday, U.N. humanitarian chief Deborah Amos said more than half of Syria's health facilities have been destroyed or damaged in the war and many children are not getting vaccinated or going to school. She also expressed concern over those near Syria's borders who have not been allowed to leave the country.